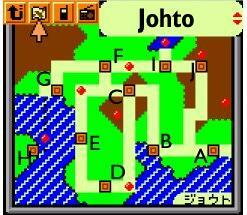 Pokemon Gold & Silver bring our hero to a new section of the continent; Johto. Towns and routes, familiar to the Red and Blue games, can be found by going east from New Bark City, your starting town. Click on the maps below for routes and landmarks!